Note the blue and red lines in the chart above. If you were to just look at those, you would conclude that they are totally separate instruments. Trend is different. The volatilities of the time series are different. And yet, they represent a single market: the SPY ETF of U.S. stocks. The blue line represents cumulative price changes during the overnight (from each day's close to the next day's open) and the red line represents cumulative price changes during the day session (each day's open to the same day's close). What can we infer from these time series? 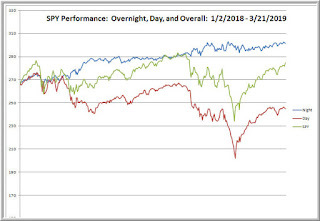 * Much of the overall upward trend in stocks has been expressed during overnight and pre-market hours in response to overseas buying and buying in response to pre-opening data releases. Day traders have not participated in the general upward drift of stocks over the past 15 months. * Flows from overseas impacted by the returns from international markets are markedly different from flows dominated by U.S. participation. The series is dominated by the trade during the last quarter of 2018, when U.S. participants bailed out of stocks relative to non-U.S. participants. Much of the rebound so far in 2019 has been those U.S. participants jumping back into stocks. * Swing trading has been difficult because these time series are independent. We cannot assume continuity from day periods to overnight periods. 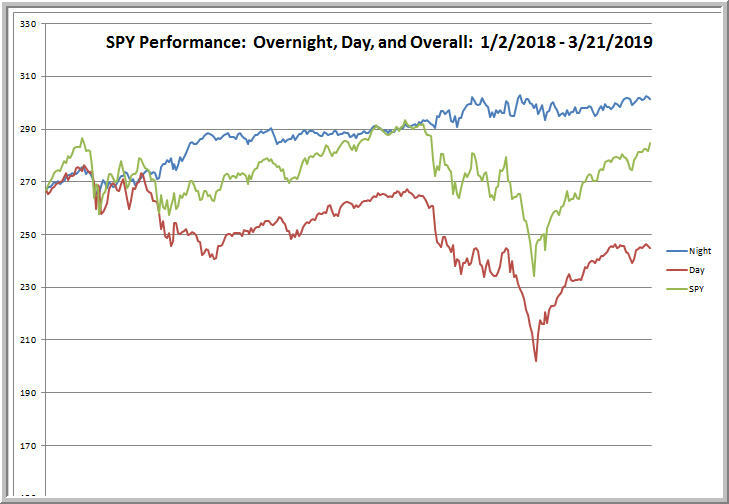 The correlation between price behavior during the day and during the overnight has been -.03. For this same reason, investors managing risk very tightly can easily get stopped out when trading in one period fails to follow through with the action of the previous period. I will hazard yet another perspective: Recent trading in U.S. stocks has been dominated by the herd behavior of equity and macro funds. Those funds, spooked by seeming Fed tightening, began selling in 2018 and then accelerated their selling to retain profits for the fiscal year. When the Fed emphasized "patience" in its rate and balance sheet policies, those funds were underinvested and needed to gross up their exposures to generate performance for the new year. Interestingly, we're starting to see divergences in behavior among sectors, with banks, industrials, and small caps underperforming. That may be an initial indication that the herd might be behaving in less herd-like ways going forward. At some point, the fundamentals of individual companies and industries will begin to matter once again. New Bull Market: Who Dis?